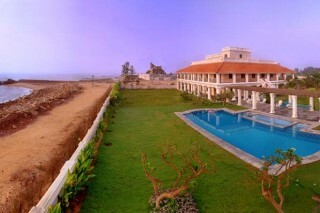 Situated in Tharambagadi, the land of singing waves on the Coromandel Coast, the rocky beach-side stylish Colonial property encompasses the beauty and charm of Danish architecture. This heritage property is popular with honeymooners and those on a backpacking budget. 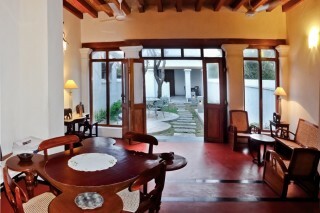 The timelessness of this colonial bungalow is evident in the well maintained rooms and tranquil surroundings. With east facing rooms, and waking up to the warm halo of the rising sun, every morning is an experience to cherish. The bungalow is distinctively luxurious as it provides exhilarating experience of viewing the best of architectural treasures that the town has to offer, right from the verandah right outside the rooms along with the fresh sea breeze that brushes against the window pane. 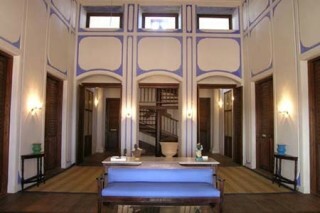 High ceilings and wooden flooring provide the touch of old world charm. Most of the rooms have four poster bed, luggage space and a private bathroom. Open spaces and terraces provide the perfect ambience for a serenely private getaway. The coastal setting, salt laden sea breeze, uncluttered décor within the rooms make this lovely property the perfect place to unwind! The highlight of this classic room, located on the first floor and named after a Danish ship which sailed to Tranquebar, are the exquisite views that would simply make you marvel at the historical setup and the exotic locales of this property. Opening into a verandah that provides 180 degrees view of the sea, the warm sea breeze would instantly make you feel light headed and relaxed. The pristine beauty of the sea in the backdrop with the view of the in-house swimming pool in the front provide a mesmerizing blue sight that is soothing to the mind and calming for the soul. The 14th century Masilamani Temple can be seen from the window while the Dansborg Fort can be viewed from the verandah. The room features a walk-in dressing room that allows for privacy within the room and also acts as additional storage space for luggage. Well equipped restrooms, ambient lighting within the room and a vintage style four poster bed complete the simple and prim interiors. Expect the warm hospitality of the staff that makes every minute of your stay comfortable and amiable. Guests can enjoy food at the in-house restaurant prepared by expert chefs ranging from continental to Tamil or enjoy a swim in the in-house swimming pool that also features a kids pool. The 14th century Danish style architecture comprising of high ceilings, archetypal furnishings and wooden floorings remind of the surreal charm of a golden era gone by. The well maintained clean surroundings, the breathtaking view of the sea and the rocky beach around, along with collector's art pieces in rooms and the uncluttered feel makes this colonial era property is a perfect spot to spend your vacation. Housekeeping Services are provided daily. As per Government regulations, It is mandatory to provide identity proof of all adults during check-in. Foreign nationals and diplomats are required to carry their passport and visa. Tranquebar is a Dutch, Danish, British Colonial Heritage Town and is easily accessible via a picturesque 2 hour drive from Pondicherry. The place along with a unique stay experience, also has many historic buildings in the near vicinity that guests can visit. Masilamani Nathar Temple is a 700 year old temple built by Pandya dynasty and combines a unique mix of Chinese and Tamil Architecture. The temple shares boundary with the property and is easy to visit. Another nearby attraction is the Dansborg Fort , which again is at a stone’s throw distance from the property. This fort is the second largest Danish Fort and has the Dansborg Archaeological Museum situated inside which guests can visit. Boat Visits to the nearby fishing villages can be arranged. The beach at Tranquebar, with its rich ozone layer has an overall rejuvenating effect on the body is a great place to relax and unwind.